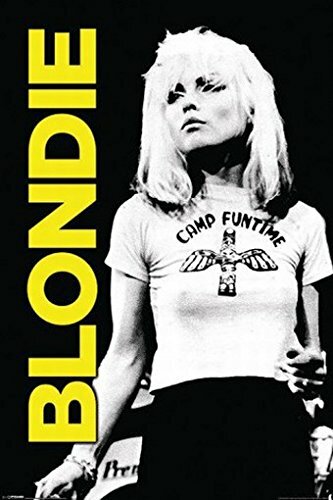 After forming in 1974, Blondie became pioneers of the punk and new wave scene. However, it wasn't until 1978 when they acheived mainstream success with their Plastic Letters and Parallel Lines albums. It was the band's gender-swapping cover of the song "Denise" by Randy & The Rainbows (which became "Denis") that gave the band their first taste of success, which peaked at #2 here in the UK. The cover of the band's 1978 critically-acclaimed album Parallel Lines is probably their most iconic, and is recognised the world over. The songs were just as memorable, too, with hits including "Hanging On The Telephone, "Sunday Girl", "Heart of Glass" and "Picture This". Yes, it's that white dress again! This Blondie 2018 calendar features images taken by the band's guitarist who is also an acclaimed photographer. Calendar also available in the U.S. 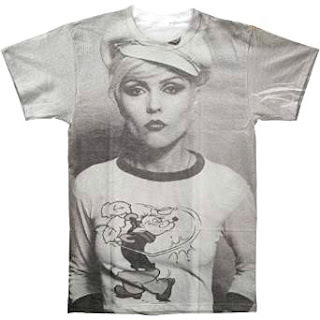 Cartoon characters frequently appear in fashion trends, and one of Debbie Harry's most memorable looks was from 1978 when she wore a sailor hat with a Popeye T-shirt. This T-shirt for men is available at Amazon.com, although it's not available in the UK, sadly. However, there are usually several being sold on eBay. Now this really was a wild look, and it was created for the front sleeve of the 1982 album The Hunter. 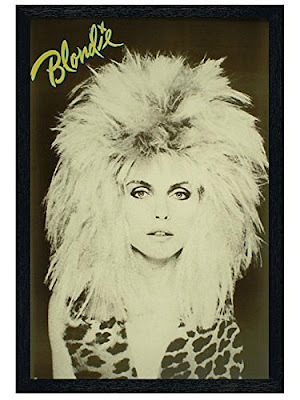 Debbie sometimes dabbled with animal print which became popular with rock artists. Rod Stewart is another animal print loving artist that springs to mind. 80s glam rock bands regularly wore animal print, and if you want to recreate a rock look, then add leopard, cheetah or zebra print clothing to leather and/or denim. One of the most memorable videos from the 80s was "Atomic", in which Debbie wore her iconic bin liner outfit with a ripped Vultures raglan sleeve T-shirt. This would be a very easy look to replicate for a fancy dress party. 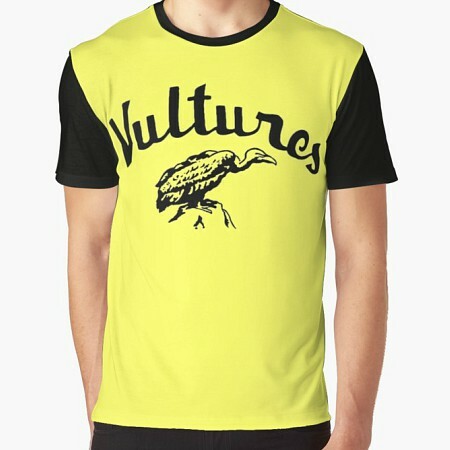 Redbubble have a replica available (above) in the same colours. However, the women's tees are not available in this colour which is bizarre, apart from a T-shirt dress. There are several sellers on Etsy and the prices are really decent here. Just add a large bin liner (you will probably have to add an extra liner or two to get the length) and a blondie wig and some ripped black tights or leggings and you have a costume! Posters are actually a great way to observe many of Debbie's fashion styles. 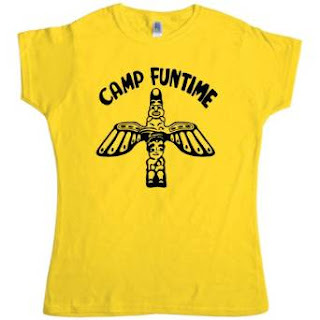 You can easily recreate this iconic look using a "Camp Funtime" winged totem pole Tee which I found at Amazon. There are several sellers selling this Camp Funtime Tee at Amazon.com in the U.S. Unfortunately, the U.S. T-shirt is poorly rated by customers. However, you can also buy this design at Redbubble.com who ship worldwide. 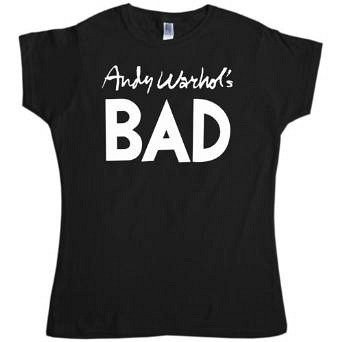 Andy Warhol's Bad was a comedy film produced by the legendary pop artist himself. Debbie Harry wore the T-shirt on stage (with vertical striped leggings) in 1979 and it also features on the front cover of the European edition of Blondie's Atomic single. Another iconic image is this punk pop art design which you will see all over the web these days in various forms. A leopard print background has been added to this one. 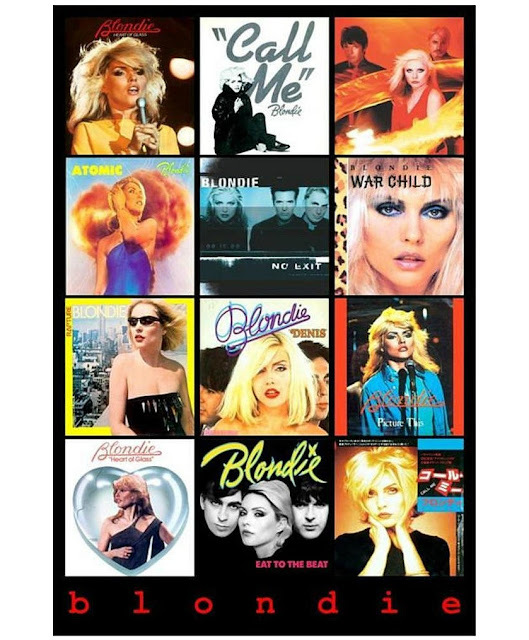 A nice range of Blondie posters can also be found at Redbubble. Blondie T-shirts are still as popular as ever and are regularly being bought from our 80s website (via links to other sites). During the pop and rock festival season the sales will, no doubt, explode. 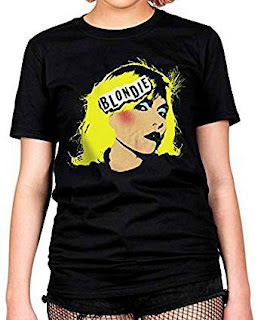 If you're off to a 70s or 80s party/festival or retro music event then a Blondie tee is a fine choice. Redbubble have a great range of designs that have been created by independent artists. Some are merely copies of classic designs, but there are many original designs, too, so they are well worh checking out and the prices are decent, too. eBay also have a wide range of new T-shirts and the prices are ultra competitive. You can view a whole range of 80s T-shirt ideas for adults at our website SimplyEighties.com. Finally, I want to leave you with this awesome record sleeves poster. Click/select the image to see its full size. Don't miss the Blondie page at our website which is packed with photos and videos. Awesome 80s Wall Clocks - How Cool Are These?